So much yarn, so little time. : Bold as brass? 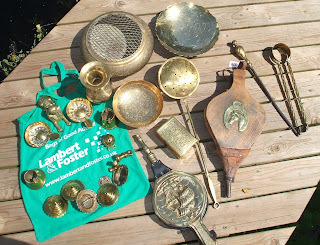 I went to a real life auction last week and bid on a mixed lot of brass. I particularly wanted the chestnut roaster as we have an open fire and had to improvise with a frying pan last year when my son bought chestnuts! I'm gradually working out what to do with the other items, some will go to ebay but others are destined to be upcycled. So far I have a few pots of flowers which used to be ashtrays! Anyone know what they are? They're around 3" in diameter, and around an inch deep, rising to a point. At the moment I see them as miniature hanging baskets! nice blog, i think i saw your nickname somewhere else.... crochetville perhaps? i was just surfing blogs,... see you!!! let me know when u find out. did yoou findthe name of the singer ? thanx for stopping by I'm adding your link. Actually I'm wondering if they're from a horse's harness, maybe the straps thread through? Way too big for buttons. Two of them would make a nice bra for a small madonna! 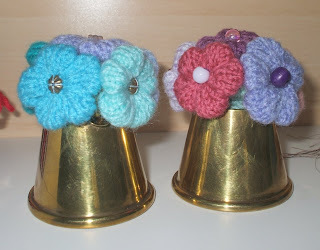 I love trinkets and bits and bobs like you have found!THe upcycled flowers are so sweet! Im always hunting at sales and auctions for little things, like teeny sewing kits.